Atiyeh Vaezipour is a research fellow at Recover Injury Research Centre, at the University of Queensland. She is part of a research team, working on the development and evaluation of innovative telerehabilitation technology solutions to improve the delivery and availability of evidence-based health services. Atiyeh has a special interest in human-centred design and designing technologies that are both useful and accepted by end-users. She is also a member of the Human Factors and Ergonomics Society of Australia and Australian Computer Society (ACS). Atiyeh’s background is in information technology and computer science, and in particular, Human Computer Interaction (HCI)/ User Experience (UX) in health and road safety research settings. As a part of her doctoral research, she was involved in a multidisciplinary Australian Research Council Discovery Grant project at the Centre for Accident Research and Road Safety - Queensland (CARRS-Q), at the Queensland University of Technology, and led by Professor Andry Rakotonirainy. Her research involved the design, development and evaluation of technology interventions to reduce fuel consumption and improve safe driving to reduce the impacts on human health associated with pollution and road trauma. She is skilled in both qualitative and quantitative research methods. 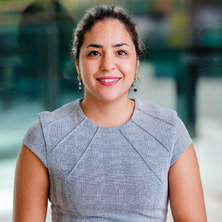 Atiyeh is also passionate about advocating science, technology, engineering and mathematics (STEM) education in women which is currently under-represented in Australia. Design, development and evaluation of innovative rehabilitation technology solutions to improve the delivery and availability of evidence-based health services. The main goal is to enhance user experience and improve the interaction between end-users and technology by designing and developing solutions that are tailored to the needs of individuals who undergoing a rehabilitation journey. Design, development and evaluation of technology interventions using virtual reality driving simulator (Automotive HMI/ Automotive UX) to reduce fuel consumption and improve safe driving to reduce the impacts on human health associated with pollution and road trauma. Many factors may influence health professionals’ decisions about using technology in their clinical practice, as various patient groups require different adaptations and requirements. Participatory design approach will provide an opportunity to develop interventions by involving end-users in the design and development process and prevent a range of issues such as limited user acceptance and poor implementation rates among end-users. Orfila, Olivier, Gruyer, Dominique, Geoffroy, David, Glaser, Sebastien, Rakotonirainy, Andry, Vaezipour, Atiyeh and Demmel, Sebastien (2016). Immersive driving simulation architecture to support gamified eco-driving instructions. In: 23rd Intelligent Transportation Systems World Congress, Melbourne, Victoria, (). 10-14 October 2016. Vaezipour, A. and Kangilaski, T. (2014). Business and IT alignment in enterprise considering the Partner Network's constraints. In: 9th International Conference of DAAAM Baltic: Industrial Engineering, DAAAM-Baltic 2014. International Conference of DAAAM Baltic: Industrial Engineering, Tallinn, Estonia, (213-218). 24 - 26 April 2014.